A part of the mission statement of Purestream ES, LLC is to bring new and innovative advanced wastewater treatment products to the marketplace at a reasonable cost. The In-Eko Microscreen Drum Filter is by far our most convincing proof that we are succeeding. The affordable and user-friendly Microscreen Drum Filter is a compact unit designed to produce high quality tertiary treatment consistently. Available in a stand alone unit or in a configuration to be installed in a concrete channel, the flexibility and low horsepower requirements make this a perfect addition to your new project, or an option to bring existing plants into compliance. The In-Eko Microscreen Drum Filter is manufactured using the highest quality 304 stainless steel as well as durable and non-corrosive plastics. The filter media itself is a stong polyamide nylon that is available in a number of sizes of openings. For more rugged applications, such as mining operations, we can also offer a stainless steel media that is more resistant to sharp objects. No part of the drum filter ever needs lubrication and maintenance is limited to the periodic replacement of the filter media. 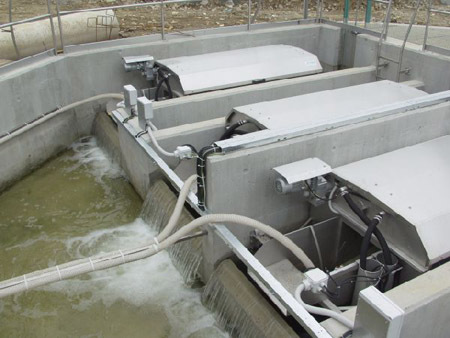 With lower effluent limitations becoming more and more prevalent, the In-Eko Microscreen Drum Filter is the perfect piece of equipment to upgrade an existing facility. Our filter is completely self-contained. There is no need for additional controls, tankage, pumps, or an outside water supply as the backwash cycle is performed using the filtered water. The In-Eko Microscreen Drum Filter offers lower capital and operational costs than any other filter. 304 Series stainless steel means less maintenance and no corrosion.